SmartBone has an optimal osteointegration! Histological analyses performed during clinical trials showed that SmartBone grafts strongly supported native bone growth, which progressively replaces the grafted material completely, resulting in a fully integrated region of new bone. Histologies are the very best way to understand and assess the way a bone graft supports the formation of new bone and finally achieves a complete osteointegration. SmartBone is a successful bone graft, having shown osteoconduction (guiding the reparative growth of the natural bone) and osteoinduction (encouraging undifferentiated cells to become active osteoblasts) and being finally reabsorbed and replaced as the natural bone heals over a few months’ time. After 2,5 years SmartBone is completely substitute and the osteogenesis has formed a lamellar bone with cement lines; many osteocytes inside the lacunae and a good angiogenesis are very well evidenced. SmartBone together the native bone makes up a osteoinductive system. 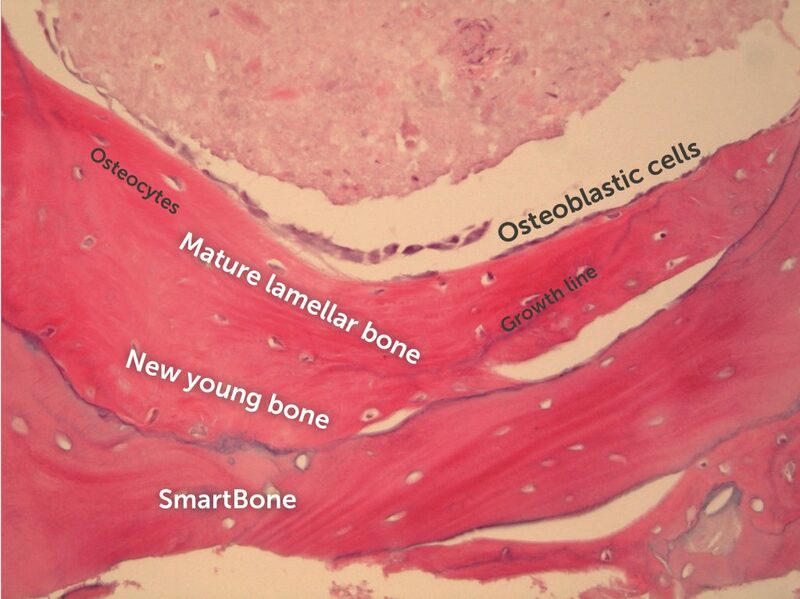 SmartBone is progressively replaced by new young bone: osteoblasts are visible both in the active and in the quiescent state, when, after having formed mature lamellar bone, they become osteocytes, as evidenced inside the lacunae. In the pictures an intense new formation of bone around the SmartBone matrix (bone with empty gaps) is noticeable. This highlights a good osteoconduction of the material. 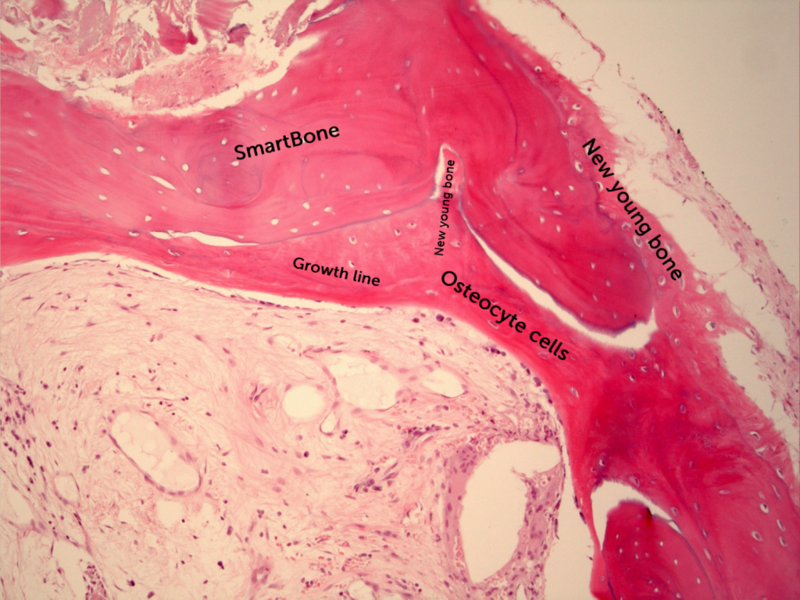 Inside the new bone matrix, purple lines (lines of growth) demarcate a good osteoinduction. This phenomenon is also evidenced by osteoblasts arranged on the outer surface of the newly formed bone. The pictures clearly show osteocytes within the gaps and a hint of bone lamellae, therefore the bone is on a maturing process.